The Gentlemen's Monthly: Chapel Renovation. 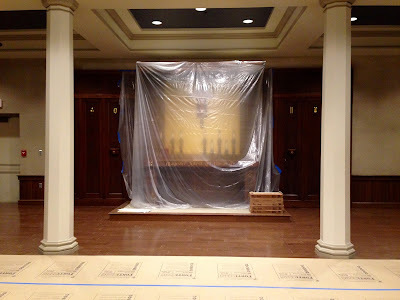 How's the St. Ed's Chapel renovation progressing? Well, in short, it's going. The wood flooring has been completed, new chairs ordered, and the "illumination" of the altar, repainting the gold accents, continues. One interesting thing to point out is that the gold ascents along the altar wall, always there but hidden as they blended into the wall, have been painted for the very first time. Suffice it to say, these ascents are striking and now stand out. What's next? Painting. A paint scheme has yet to be selected, and what will it be? More on that later. Still, will the renovation be completed in time for the start of school? Let's flip a coin.